This is continuation of my earlier post of Plastics. Polyethylene terephthalate (PET) is clear, tough, and shatterproof. It provides a barrier to oxygen, water, and carbon dioxide and is identified with the number 1. PET's ability to contain carbon dioxide (carbonation) makes it ideal for use in carbonated soft drink bottles. Take a look at the bottom of your soft drink bottle and you will most likely find a number 1 there. PET is also used to make bottles for water, juice, sports drinks, beer, mouthwash and salad dressing. You can also find it on your food jars for peanut butter, jam, jelly, and pickles as well as in microwavable food trays. PET is globally recognized as a safe, recyclable packaging material. Numerous tests have created a broad scientific consensus that PET is non-toxic and is a safe material for the storage of food and beverages. It is intended for single use applications; repeated use increases the risk of leaching and bacterial growth. PET plastic is difficult to decontaminate, and proper cleaning requires harmful chemicals. Polyethylene terephthalates may leach carcinogens. PET plastic is recyclable and about 25% are recycled. The plastic is crushed and then shredded into small flakes which are then reprocessed to make new PET bottles, or spun into polyester fiber. This recycled fiber is used to make textiles such as fleece garments, carpets, stuffing for pillows and life jackets, and similar products. 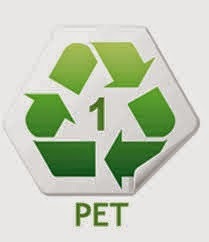 Products made of #1 (PET) plastic should be recycled but not reused.